There is some confusion in Aromatherapy centered around the carrot. 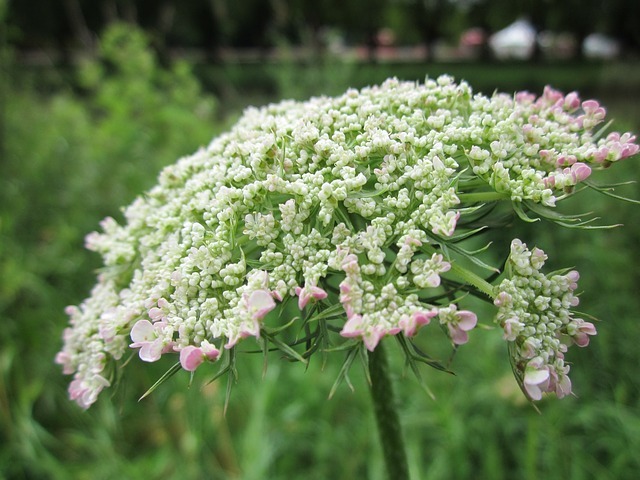 There are several different products based on Wild Carrot (Daucus carota) including an essential oil, a carbon dioxide extract, and fixed oils. It may seem that they would have the same properties, but chemistry says they don’t. An essential oil consists of molecules light enough to evaporate and be captured in distillation. A CO2 extract is made up of heavier components that are obtained from using pressurized carbon dioxide in the extraction. Fixed oils are either an infusion or pressing and have varying constituents, including those of any base oil that is added. So, you can see that it is important to know how the plant was processed. The essential oil is steam distilled from the tiny seeds. It is popular to use in skincare because it promotes skin health and cell regeneration, despite its woody and earthy scent. In formulation it is nourishing to aging skin, as well as being beneficial in cases of eczema. CO2 extraction of carrot can be performed on the seed. When the root is the plant source it is called helio carrot. The two different extracts have different therapeutics because of the differing chemical makeup of the plant parts used. The seed CO2 is similar to the essential oil and is used for dry, wrinkled skin. The root extract is often used to aid burned or damaged skin because it is one of the highest plant sources of beta carotene, which is not found in the seed extract. More mystery surrounds the fixed, or non-volatile, oils. The infused variety of carrot oil uses the taproot, not the seed, which is macerated in a carrier such as sunflower oil. There is also the cold pressed oil of the seed that is filled with fatty acids. Both of these are used to heal dry, chapped and cracked skin, and to condition hair. I hope this discussion didn’t leave you more baffled. The most important thing to remember is that it is critical to understand what you are buying. “Carrot Oil” can be many things, depending on what it is made of and how it is made, and each type of the oil has its own uses.